Joseph Athanase Doumerc, commonly known as Paul Doumer (French pronunciation: ​[pɔl dumɛːʀ]; 22 March 1857 – 7 May 1932), was the President of France from 13 June 1931 until his assassination on 7 May 1932. Joseph Athanase Doumerc was born in Aurillac, in the Cantal département, in France on 22 March 1857. Alumnus of the Conservatoire National des Arts et Métiers, he became a professor of mathematics at Mende in 1877. In 1878 Doumer married Blanche Richel, whom he had met at college. They had eight children, four of whom were killed in the First World War (including the French air ace René Doumer). From 1879 until 1883 Doumer was professor at Remiremont, before leaving on health grounds. He then became chief editor of Courrier de l'Aisne, a French regional newspaper. Initiated into Freemasonry in 1879, at "L'Union Fraternelle" lodge, he became Grand Secretary of Grand Orient de France in 1892. He made his debut in politics as chef de cabinet to Charles Floquet, when Floquet was president of the chamber in 1885. 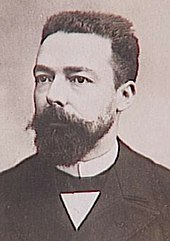 In 1888, Doumer was elected Radical deputy for the department of Aisne. Defeated in the general elections of September 1889, he was elected again in 1890 by the arrondissement of Auxerre. He was briefly Minister of Finance of France (1895–1896) when he tried without success to introduce an income tax. Doumer was Governor-General of French Indochina from 1897 to 1902. Upon his arrival the colonies were losing millions of francs each year. Determined to put them on a paying basis he levied taxes on opium, wine and the salt trade. The Vietnamese, Cambodians and Laotians who could or would not pay these taxes, lost their houses and land, and often became day laborers. He established Indochina as a market for French products and a source of profitable investment by French businessmen. Doumer set about outfitting Indochina, especially Hanoi, the capital, with modern infrastructure befitting property of France. Tree-lined avenues and a large number of French Colonial buildings were constructed in Hanoi during his governance. The Long Bien Bridge and the Grand Palais in Hanoi were among large-scaled projects built during his term; the bridge was originally named after him. The palace was destroyed by airstrikes toward the end of World War 2. The bridge survived, became a well-known landmark and target for US pilots during the Vietnam War. After returning from French Indochina, Doumer was elected by Laon to the chamber as a Radical. He refused, however, to support the ministry of Émile Combes, and formed a Radical dissident group, which grew in strength and eventually caused the fall of the ministry. He then served as President of the Chamber of Deputies (a post equivalent to the speaker of the House of Commons) from 1902 to 1905. Doumer became Minister of Finance of France again in 1925 when Louis Loucheur resigned. He then served as President of the French Senate from 1927 until the 1931 presidential election. He was elected President of the French Republic on 13 May 1931, defeating the better known Aristide Briand, and replacing Gaston Doumergue. 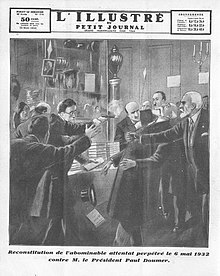 Le Petit Journal, 15 May 1932. On 6 May 1932, Paul Doumer was in Paris at the opening of a book fair at the Hôtel Salomon de Rothschild, talking to the author Claude Farrère. Suddenly several shots were fired by Paul Gorguloff, a mentally unstable Russian émigré. Two of the shots hit Doumer, at the base of the skull and in the right armpit, and he fell to the ground. Claude Farrère wrestled with the assassin before the police arrived. Doumer was rushed to hospital in Paris, where he died at 04:37 AM on 7 May. He is the only French president to die of a gunshot wound. As an author he is known by his L'Indo-Chine française (1904), and Le Livre de mes fils (1906). ^ a b c One or more of the preceding sentences incorporates text from a publication now in the public domain: Chisholm, Hugh, ed. (1911). "Doumer, Paul" . Encyclopædia Britannica. 8 (11th ed.). Cambridge University Press. p. 450. ^ Ladenburg, Thomas. "The French in Indochina" (PDF). digitalhistory.uh.edu. University of Houston. Retrieved 11 September 2015. François Paul Jules Grévy was a President of the French Third Republic and one of the leaders of the Opportunist Republican faction. Given that his predecessors were monarchists who tried without success to restore the French monarchy, Grévy is seen as the first real republican President of France. Paul Painlevé was a French mathematician and statesman. He served twice as Prime Minister of the Third Republic: 12 September – 13 November 1917 and 17 April – 22 November 1925. His entry into politics came in 1906 after a professorship at the Sorbonne that began in 1892. Claude Farrère, pseudonym of Frédéric-Charles Bargone, was a French author of novels, many of which are based in exotic locations as Istanbul, Saigon, or Nagasaki. The Banque Industrielle de Chine, or Industrial Bank of China, was chartered in 1913 and was closed in 1922. The bank's Chinese office was in Shanghai and its European office in Paris. Its chief director was A.J. Pernotte. Louis Loucheur was a French politician in the Third Republic, at first a member of the conservative Republican Federation, then of the Democratic Republican Alliance and of the Independent Radicals. The Grand Palais or Grand Palais de l'Exposition was an exhibition and trade fair complex in Hanoi, Vietnam. It was built for the 1902 Hanoi Exhibition world trade fair, as the city became the capital of French Indochina. It was completely destroyed by airstrikes at the end of World War II.